Posted 4:30 PM by balanceatx.com & filed under Acupuncture Health. I often say that this time of year gives us a great reminder of why we live in Austin. It is hard to beat a sunny day in the 60s in December. 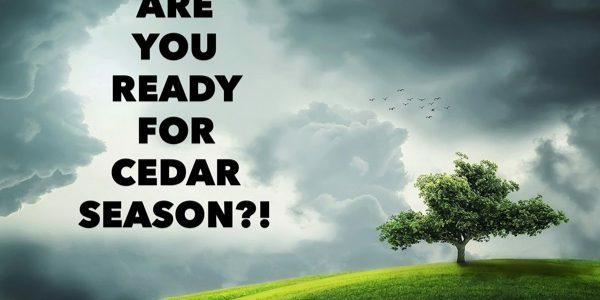 But come January, Cedar season knocks a good percentage of Austinites down for the count. “Cedar Fever” sounds relatively innocent, but it often mimics symptoms of the flu: headache, body aches, fever, congestion, cough, watering eyes, fatigue… Those who have had to suffer with Cedar Fever know that this is not “just allergies” that you can muscle your way through. To make matters worse, this season is shaping up to be a bad one for cedar pollen. Remember all that rain we got over the last few months? That makes the Ashe Juniper (or “Mountain Cedar”) trees happy and ready to produce a lot of pollen. More pollen = more potential symptoms. But there are steps you can take to improve your chances of getting through this season unscathed, or at least far better off than you would otherwise. In a nutshell, allergies are an overreaction of the immune system to a pathogen, or in this case, cedar pollen. If we can prime the immune system BEFORE the cedar pollen hits, we won’t have as many symptoms because our immune system is not reacting as much. Adjust your diet. At least part of the reason people tend to get hit so hard by cedar pollen specifically is because cedar pollen is at its worst in January and February, right after a sugar-filled holiday season. Sugar specifically causes inflammation and creates dysbiosis (or bacterial imbalance) in the gut. It has been estimated that 70 to 80 percent of immune cell tissue resides in the gut, making a high-functioning digestive system a top priority to improving immune system function. Except in extreme circumstances, I am not suggesting you need to eliminate sugar completely (the horror! ), however I highly recommend limiting consumption of foods that can inflame the gut: sugar in all its forms, alcohol, gluten, dairy, and processed foods. Work on your stress. Chronic stress has been shown to alter immune system function, so finding ways to de-stress is essential to making sure your system is ready to deal with cedar pollen. I highly recommend meditation (using apps such as Headspace or Calm, or attending our workshop), yoga, tai qi or otherwise prioritizing activities that you know help you relax (taking a walk or a bath are good options). Use Chinese herbs. The Chinese have a long recorded history of using herbs for various health conditions. Allergies have been around for a long time, so there are a lot of proven options for herbal remedies. The right formula for you will depend on your symptoms and current state of health, and I highly recommend consulting with a Licensed Acupuncturist before starting an herbal formula. Yu Ping Feng San or Jade Screen is a common formula used to boost immune system function in preparation for allergy season. Get acupuncture. Acupuncture has been proven to modulate immune system function as well as affect the nervous system directly and gut function, all of which we have discussed above as having a role in how your body responds to allergens. Acupuncture for allergies tends to work best if you start 1-3 months before you expect to develop symptoms. In case you have tried to block the memory from your consciousness, let me remind you that Cedar Fever is terrible – it can make you feel like you have the flu and keep you off your game for weeks or more. Do you have the time in your schedule to deal with that this year?